IS THE ALL NEW TRAK SHAK THE PERFECT GO ANYWHERE FAMILY RETREAT ON WHEELS? The latest version of the much-loved, family-orientated, super-capable Trak Shak camper to hit the tracks has had a full makeover…. from top to bottom and front to rear. Renowned for its family-friendliness with the inclusion of two queen-sized beds, plus a double ‘cubby’ or ‘sleep out’ cleverly tucked underneath, the Trak Shak can easily accommodate 6 weary adult souls, or throw in a gaggle of giggling kids, all without taking up the floor space that is reserved for luggage, kids toys and other camping paraphernalia. Now, that’s one huge advantage the Trak Shak has over almost all other camper trailers – the floor space of most others gets used up for sleeping those extra bodies; not so with the Traky! Of course, if you're not making full use of all that floor space with your brood and their little mates, then you’ve simply got extra room to stash your luggage and still have plenty of floor area to… umm… play Twister… or brush up on your acting skills for one of those ‘Pretend You can Dance’ shows. What probably isn't overly evident to non-Traky-connoisseurs is that huge canvas tent is in fact 150mm higher than before. “So what” you may declare with a sneer… well, perhaps in all reality it doesn't make all that much difference to looks, but, for those wanting to be overly technical, it more-likely-than-not would make the internal space a little cooler... perhaps! Then again, with the addition of the Tropical Solar Roof, the manufacturers claim a huge decrease in inside temperatures – whoa, that’s enough to wanna’ tick that option’s box! Staying with the canvas for a little longer; the next major draw card for the upgraded Traky is the addition of optional canvas walls with huge mesh screens that Velcro onto the awning, which is also that 1500mm higher – perfect for all those lanky campers that had to duck under the older Traky awning. These walls are three separate units than can be added on individually (to make a wind, rain or sun break) or in their entirety to form a fully (except for a floor) enclosed extra room – as if there wasn't already enough undercover acreage! This new awning wall system is claimed to provide up to 95% mesh coverage when all canvas windows and doors are opened. All canvas is the well-regarded Wax Converter Textiles brand, plus there is plenty of double-row stitching and reinforcing patches to make, what seems like, a very well-made tent. Two queen-sized inner-spring mattress are now standard – perfect for those mischievous kids that have to jump up and down, up and down… up…. and down… Plus, the bed-head end-canvas and mesh screen windows open separately to allow uninhibited air flow… or to let the kids jump right out of the tent – be careful; you’ve been warned as the landing is on the draw bar! While the ‘older’ Traky did have independent trailing arm and coil spring suspension, it was found a little wanting in its design with regard to adjusting toe-in via shims within the hubs - doable, but fiddly! The new suspension is a totally revised set up: while still trailing arm and coil sprung, it features eccentric (cammed) adjustment for the toe-in, plus incorporates twin shock absorbers that stand more upright to control the weight of the Trak Shak and its onboard luggage. Nylon webbing drop-off straps are also included to ensure the swing arms don’t over-extend the shocks. While some may speculate the inclusion of a spare wheel hub as standard fare is a little unnecessary or gimmicky, it’s still there in the new spec. It’s non-braked, simple to replace roadside if necessary and would get you out of a hell of a lot of trouble… so, why not include it I say. The previous C-section draw bar has been replaced with a 100 x 50 x 4mm thick galvanised RHS version onto which is fitted a galvanised chassis and sub frame together with the aforementioned redesigned suspension. 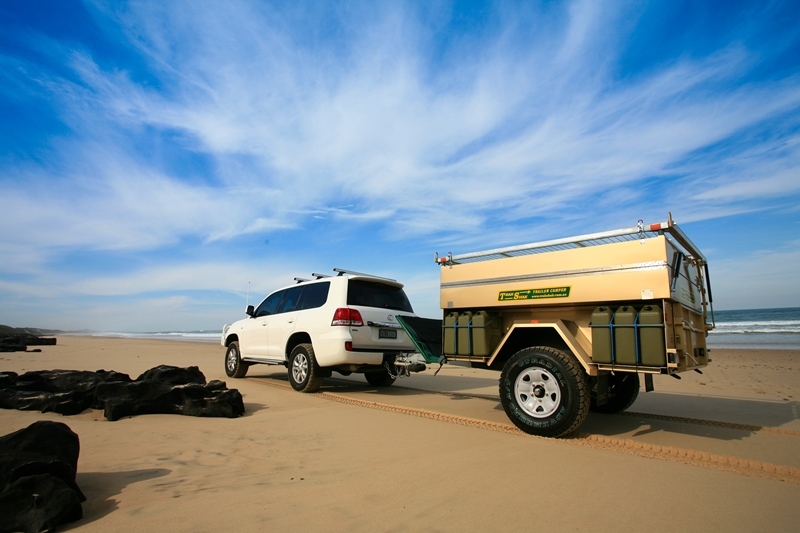 A polyblock offroad hitch is still the preferred attachment system to the vehicle, plus override and electric brake systems are incorporated. A more-user friendly swing-up jockey wheel is now employed rather than the older ‘bolt-on’ type. That, to me, makes life much simpler every time you set up camp. No more detaching the jockey wheel and having to find somewhere to store it. Hard-core naysayers may declare that the jockey wheel will ‘snig’ on mother earth, but the clever sods at Trak Shak have allowed for pinning of the 10-inch pneumatic wheel in the horizontal position to help alleviate that problem – clever… and simple! The unique gas-strut-assisted, side-operated boat loader is now fully galvanised and comes to rest in the open position 90mm higher off the ground allowing deeper hulled boats to be used, plus the outboard motor mount is now a nylon block rather than the split-prone timber version. Also unique to the Trak Shak are front and rear swing-open tailgates – both of which have been redesigned providing extra strength to cater for the fridges, generators and kitchen they carry. Hella LED tail lights are now utilised and also incorporate reverse / work lights. All fridge and external power outlets use 50A Anderson plugs to ensure solid electrical connection. The overall height of the closed unit is higher; the ‘suit case’ section of the metal work that contains the canvas tent being 80mm higher which allows extra bedding and even extra kids mattress to be stored within. The side opening tool box is 40mm deeper to accommodate all pegs, poles and associated gear used to set the camper up. The trailer body also sits 50mm prouder from the ground to enhance approach and departure angles. For all those ‘Master Chef’ or… ‘Blokes Burning Beef’ contenders, I’m afraid you won’t be overly enthralled by the Trak Shak kitchen. Nup’, it’s a rather plain stainless steel unit with a fold-out bench top, extendable adjustable legs and separate gas burner. It is however simply and cleverly removable from the tailgate to allow use remote from the trailer. In reality it’s great to be able to cook away from your canvas and out of the covered section of the tent – no more charcoaled rissoles splattering oil over your expensive tent – no so bad after all eh! A manually-operated hand pump draws water from one of the (up to) nine 20 litre jerry cans. Again, the jerry’s can be hauled to wherever the kitchen is set up – even by the lakes edge or atop a sand dune if you so desire. While the ability to incorporate so many separate water cans is a great safety feature and is in line with the remote use of the kitchen, it would have been great to also include an extra under slung water tank of, say… 80 to 100 litres. Perhaps a retro fit would be an easy DIY job? The front mesh stone deflector is mostly the same albeit with the inclusion of extra attachment points to prevent it flapping so readily. It’s a clever and simple setup that is quickly removed to access the front-opening tailgate. It can also be multi-positioned to protect the outboard boat motor - a wise move to protect an expensive investment! The owners of Trak Shak (company) are pretty confident they have much-improved on the outgoing model; so much so that they happily allowed Camper Trailer Australia to preview one of the very first models available in Australia. They hauled it down a fairly tricky beach entrance, through some power-sapping soft sand, along a section of well-maintained dusty, gravel tracks and set the whole kit up in next to no time. Now, this is where you readers will have to shrug off any pre-conceived notions that huge tents take an age to erect. Not so with this clever and unique system: within say, 5 minutes… 10 minutes absolute tops, you’d have the tent and attached awning set up for camp. An extra 5 to 10 minutes will see all the extra awning walls set, then there’s only personal preference repositioning of the kitchen unit. Toss out the camp chairs, flip the fridge lid and you’ll be relaxing as you dream of the many far flung destinations your new and improved Traky will take you. For more information visit www.trakshak.com.au or call (02) 9638 0771or drop into the head office at 24 Antoine St, Rydalmere NSW in Sydney.